Easy Grilled Avocado Mango Chicken Salad a refreshing healthy salad perfect for the summer! A light 30 minute meal loaded with nutrients and flavor! Preheat grill to medium high heat (about 375-400 degrees F). Season both sides of the chicken breast with salt & pepper. Spray grill grates with cooking spray or rub down with olive oil soaked rag. Place seasoned chicken breasts on the grill. Grill each side for 5-7 minutes, until there is no longer any pink. Remove from grill and let rest for 3 minutes to let the juices redistribute. While the chicken is resting. In a small bowl add honey, mustard, apple cider vinegar and dry basil. Whisk to combine until the mixture is smooth and feels like a dressing. Slice the grilled chicken breasts. 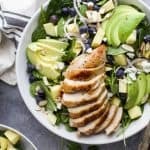 Assemble the salad: to a large bowl add spinach, diced mango, blueberries, avocado, almond, goat cheese and sliced chicken. Serve with honey dijon dressing on the side.